The sophisticated Cartier look of the Fascination Series is created by its crystaline faceted surfaces. The Fascination I has a double fret design inlaid with Swarovski crystals (can be ordered without crystals). 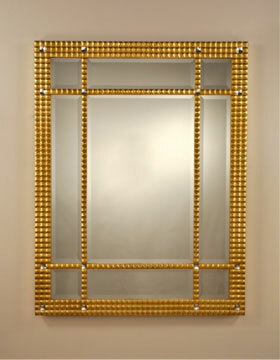 The mirrors shown are all beveled but plain may be requested. The Fascination comes finished in Gold leaf as shown, Silver leaf, black or choice of colors. The mirror is a Carol Canner original design.